I bought the NB version because of the longer arms since I am mounting the sway bar forward similar to the NB. NA6 cars have sway bars with short lever arms and the sway bar mounts for the bushings are located further rearward on the chassis legs. NA8 sway bars have longer lever arms and the sway bar bushings are mounted further forward on the chassis legs to allow clearance for the crankshaft pulley because the 1.8L BP engines are physically longer than the 1.6L B6 engines, thus the crank pulley is located further forward. If you do a 1.8L swap into a 1.6L car you almost always have to address this as clearance is minimal otherwise. NB sway bars are mounted in the forward chassis position like the NA8 sway bars but they have a different contour to the lever arms. OEM NA and NB end links are different. NA end links use simple bushings with a through bolt design that connects to the NA lower control arm which has two metal tabs. The bolted joint is in double shear. NB end links use ball joints top and bottom. Thus the NB lower control arm is different to fit the different style end link, it has just one mounting tab that is made of thicker gauge steel. You can cobble together a NB sway bar onto a NA chassis using NA lower control arms and certain aftermarket adjustable sway bar end links with heim joints. But it's a bit Mickey Mouse. Once you start taking aftermarket parts then it all depends. It might work fine. Or it might fatigue the mounting tabs on your lower control arms until they break or you might experience end link bind or interference with other components. Or you could swap to NB control arms or V8R control arms or any other number of variations. As they say, your mileage may vary. I used those same AWR sway bar mounting brackets on my car. They're awesome but beware you may run into some issues with power steering and/or AC lines depending on which version of the AWR bracket you have. Some have closed ends, some are open. They used to make two different versions, one for NA and one for NB. But now they all fit 90-05 cars. Details matter. No one may see it, but you'll know it. Dang, looks like someone cut that with a rabid beaver! I made a pretty significant mistake last Friday. I knew the temperature would peg triple digits. I knew that if I drove the Miata, it would be sitting in direct sun for most of the morning, that I would need to drive across the valley in the afternoon, and spend rush hour sitting in the Miata. I also knew that, being low on refrigerant, the AC became less effective on the hotter days. Needless to say, I spent most of the day a stinky, sweat-soaked mess. It was seriously so hot in my car that my phone kept shutting off the navigation and music player apps to prevent overheating. So today I had the AC system inspected and recharged. That's really not newsworthy, but that cold air coming out of the vents sure felt nice. Here's a picture of Finn. I'll have a better update tomorrow. 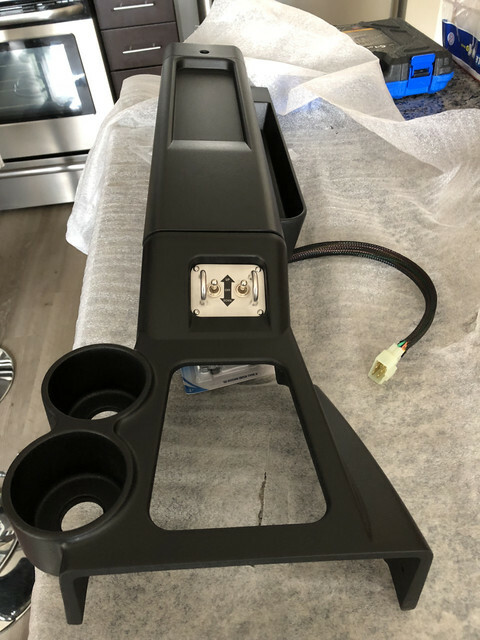 Installed my Zoom Engineering fuel lid, and received my KG works mirror, IL Motorsport center console, and RevLimiter window switches! Out with the old, in with the new. While the Cobalt exhaust may not be the most exciting option, that garbage I just uninstalled broke an internal baffle only weeks after I bought the car. So glad I don't have to hear that rattly pos anymore. Is the steering wheel in the same, stock position or is it closer? When I was looking at the hub to buy it, I wasn't sure if it would move the wheel closer to me or not. I have short legs and do not want the steering wheel any closer than the stock position. Is the steering wheel in the same stock position or is it closer? Pretty much the same position as stock since that hub adapter is like 4 or 5 inches it makes up for the dead space where the stock minivan looking airbag would go. Thanks! Did I see somewhere that the same company made a shorter version? The reason I want to by that type is how I heard they are so much better designed. Thanks for helping me out. Can't wait to pick my car up tomorrow! Itb finally installed. Yes I am still alive and modding!